Before we start, just a quick reminder that this site is advertising and donation supported. You can help keep SoCal’s best bike news coming to your screen every day by donating directly through PayPal via [email protected]; any amount is deeply appreciated. 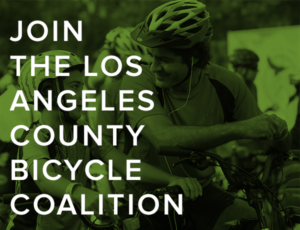 Or make a tax-free donation by check or credit card through LA Streetsblog; email the address above to make arrangements. 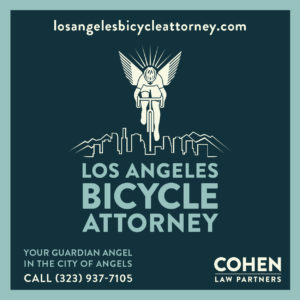 And if you market to bike riders, BikinginLA offers one of the area’s most affordable and highly targeted ways to reach cyclists in Southern California, as well as riders throughout the US and around the world. Email [email protected] for more information. Finally, let me offer my sincere gratitude to our sponsors, and to everyone who has donated help support this site. We couldn’t do this without your help. Update: Thanks to Jim Lyle and Mark Jones for their generous donations. More on last week’s waste of two hours Councilmember Gil Cedillo’s vanity session public meeting to discuss the proposed North Figueroa road diet and bike lanes. Meanwhile, LADOT installs new bike corrals on North Figueroa and Lankershim; hopefully Council Members Cedillo and Tom Labonge, respectively, will stop blocking blocking safety and livability for everyone so the bike lanes promised for both streets can follow soon. Seriously, even AARP is in favor of road diets. Sad news, as a Topanga man dies of a heart attack after a bike ride through Topanga Canyon with his new husband, just a month after they were married. Sounds like we lost a great guy. My prayers and condolences to all his loved ones. The Pasadena Mountain Bike Club is hosting a Bike Swap Meet this Sunday. KCRW traffic maven Kajon Cermak says it’s time to do something about LA’s hit-and-run epidemic and get the creeps off the road. You’re preaching to the choir, sister. 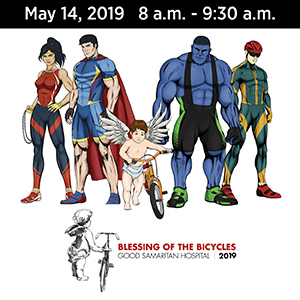 The Hollywood Fringe Festival presents Bike Odessey LA on Saturday, a combination bike tour and multi-location theatrical event. A new section of the LA River bike path opens up for bikes and pedestrians from Sherman Oaks to Studio City. Culver City’s Chubby Bikes offers a free Confident City Cycling Clinic, social ride and after party on Saturday; thanks to Walk ‘n Rollers for the tip. Speaking of Walk ‘n Rollers, they’re sponsoring a series of monthly family rides, starting July 5th in Culver City. Santa Clarita sheriff’s deputies continue to arrest additional suspects in a rash of bike path robberies. Three Santa Ana men are under arrest for critically injuring a bike rider in a possible gang-related assault. 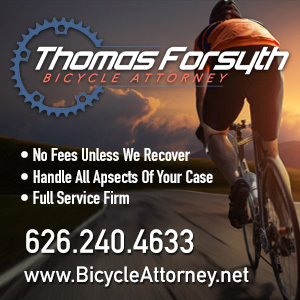 The Sacramento cyclist who was intentionally run down by a road raging driver after slashing his tire says he did it in self-defense. San Francisco cyclists get new left turn bike boxes. Santa Rosa riders team up to recover their stolen bikes. Salinas cyclists protest mud and debris from farm trucks blocking a bike lane. A new tire and tube repair tool promises to fix any flat in seconds without taking the tire off. Although I don’t know how you can fix a flat if you don’t know where the leak is until you get the tube off, which is usually the case. New bike lane design offers protected intersections for bike riders. Life is cheap in Washington state, where a driver gets off with a $175 fine for killing a teenage cyclist riding in a crosswalk. A Kansas cyclist is deliberately hit and run off the road by a road raging driver. A New Hampshire boy rides his bike to school for an entire year, regardless of the weather. Sad that something like this is actually news. Colorado-based Oskar Blues Brewery is opening a combination beer and bike ranch near the Pisgah National Forest in North Carolina. London’s Mayor Boris gets credit for the city’s bike share program, even if it was his predecessor’s idea. A writer for London’s Guardian discovers the joys of social cycling. Seriously. This has to be the most cringe-inducing bicycling injury ever. And when you’re riding a bike through Santa Monica with burglary tools and stolen credit cards, just stop for the damn stop sign, already.